We’re in the middle of an ice storm here in Cincinnati (I envy those of you in the dry west). 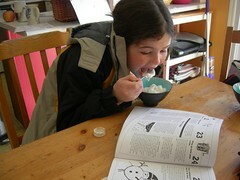 To make the best of all this snow, my kids made “snow cream” last week. Nice change of pace. Caitrin is still in her ski jacket while slurping down what can only be described as a snow slushie. Take a cup (a largish scoop) of the snow and put it in the bowl. Add several teaspoons of sugar (to taste). Dribble a bit of vanilla extract over the snow and then add enough milk to mix it all together. The end result ought to be a bit like a slushie. The sugar doesn’t really melt so expect it to taste a bit grainy. One of our kids liked it, one didn’t. I thought it was tasty! I’ve never had anyone not like it, including my skeptical husband. Ummm! Have ready a large bowl of fresh, clean snow. Gradually whisk in some of the snow until the mousse is thick and well combined. Serve in pretty sherbet glasses with a maraschino cherry, if desired. This looks so pretty in my light green depression glass sherbet dishes.